It’s September already, summer’s slowly coming to an end, or at least many of us are hoping it is. As the need for using an air conditioner begins to disappear, we struggle to find a replacement that would help us stay cool in the weird in-between weather. Table fans or desk fans are perfect for this purpose, due to the numerous choices on the market, choosing one can be hard. 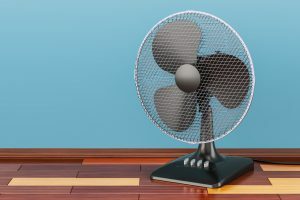 In this article, we will explain how you can choose the best table fan for your specific needs, and also introduce you to the top 7 best options available online. 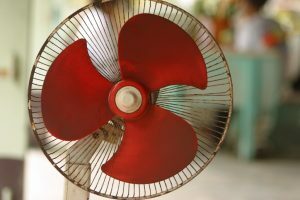 In order to choose the best table fan for yourself, there are quite a few factors you need to keep in mind before you actually buy one. There’s no point buying a large table fan if you’re going to be using it at the office, unless you want documents flying everywhere. Similarly, unless you want to annoy the person working in the kitchen, do not buy a tiny little fan for them, because all it’s going to do is take up space on the slab and be a hindrance. 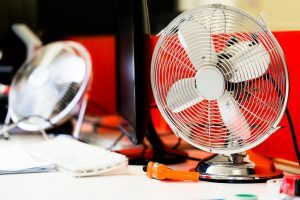 If you’re buying for personal use, say for your office desk, or study table, go for a 12-inch diameter fan, as it’ll be enough to keep you cool. If you’re buying one for a larger room, or a hotter room such as the kitchen, then get one that is somewhere between 16 to 20-inch diameter, as these areas would need more powerful ones to stay cool. Certain fans come with multiple speed settings, while some do not even have a switch to turn them on/off. If you’re planning to use your table fan in various settings, such as in the kitchen, as well as on your study table, then being able to control the speed of the fan is of utmost importance to you, as different settings require different speeds. 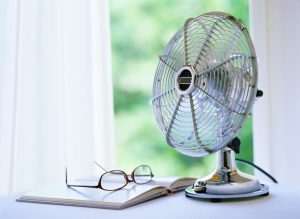 While working in the kitchen, you’re bound to sweat a lot more, so having a high speed fan is essential, regardless of how noisy it can be, but when you’re studying or working in the office, you want something that won’t blow away important notes and papers, and you’d also care more about how noisy it gets at higher speeds. Kids love touching things they’re not supposed to, including electrical sockets and table fans. Just as many electrical sockets have baby-proof versions, there are also certain table fans that are safer for babies and pets than others. The grills of such fans are designed in such a way that babies or pets cannot reach the blades. Another aspect that you might want to keep an eye out for is, whether the fan ends up overheating after it’s been running for a few hours, especially if you’re going to be using it in an area with pets or children, as it is really easy to hurt oneself around such fans. Most table fans need to be assembled once they’re bought, so obviously it’s better to go for ones that won’t have you struggling for hours. In order to know this important bit of information, we suggest you check what other users have said in the reviews. 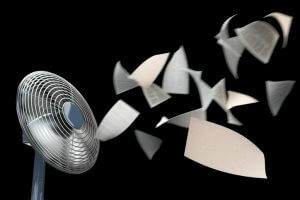 Aside from saving you time and effort the first time, such fans will also be better for when you need to clean them. Just like ceiling fans, these too will slowly gather dust and would need to clean. In order to clean them, you would have to dismantle them to properly clean both the outer grill and the blades, and then re-assemble them once done, therefore, getting one that doesn’t take too much time and effort would be beneficial. Not many people like having noisy fans, especially when they’re working or sleeping, so we would advise you to check the reviews before you purchase one, in order to successfully avoid the noisy ones. Although, if you enjoy having a noisy fan as a source of background white noise, then go for it, that’s your call. If you do like them as white noise, then we would suggest going for the smaller fans, as they’re usually much louder than the others. 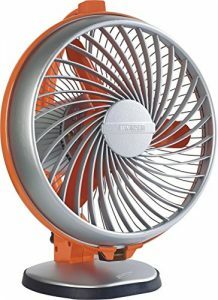 Noisy fans may also be alright for those who’re only planning to use them in the kitchen because not many people care about the fan’s noise levels while cooking. Although companies like to claim that their products will never give you any trouble, it is always wise to prepare for when they might. This is where warranties come in; they keep you covered in case something goes wrong with the fans. 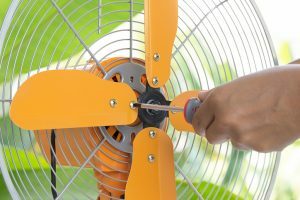 Since repairing table fans can sometimes cost almost as much as buying one, it is suggested to choose ones that come with at least a one year warranty. This is especially important while shopping online, as the product may occasionally get damaged during the delivery. 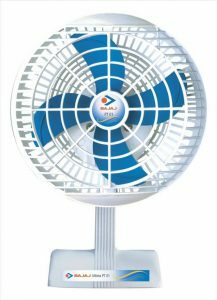 We’ve explained everything you would need to know while choosing a table fan, so let us now introduce our picks for the top 7 best table fans you can buy online in India. 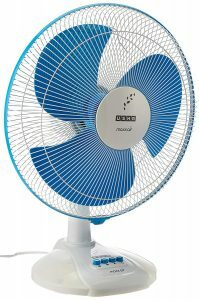 This fan is the most affordable option on the list and is recommended for those who’re looking for a compact yet powerful one to use in their kitchen. It is a really small fan, so you don’t need much space on your kitchen slab to place it, and despite its size, the speed it’s been set to is enough to keep you from sweating. 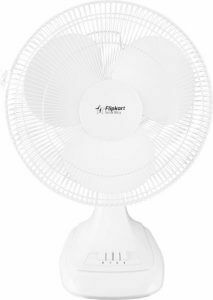 It can be a bit loud though, and while that’s good for those who like having some white noise in the background, it might not be great for those looking for a fan to use at their study or work tables. Additionally, while it works perfectly in the kitchen, you would have to clean it often, as its white exterior gets dirty fairly quickly. 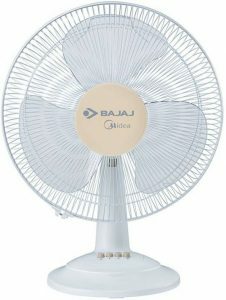 Those looking for lightweight and portable, yet high-speed fans that they can use in the kitchen, should go for this one. Despite its looks, its body actually feels quite sturdy and durable, so you don’t need to worry about breaking it. It’s also really easy to clean, as dismantling and assembling it doesn’t take long at all. It doesn’t have any speed controls though, and while the speed it’s set to is great for the kitchen, it is too noisy for any place else. It also lacks an on/off switch, so the only way to control it is by directly turning it on or off from the plug point. Considering all this, the price may seem a tad bit higher than it should be as well. If you’re looking for a sturdy fan with a secure safety grill that’ll prevent kids or pets from sticking in their fingers or paws in, then this is the one you need. It is much larger than most other table fans as well, so it works well for bigger areas too, especially when it’s used at the top speed. Keep in mind though that this is not the best option for those who want an easy to carry table fan, as this weighs 8.8 kg. It’s also not suggested for those who want a completely noiseless option, because this does considerably louder than most other other options in this price range. 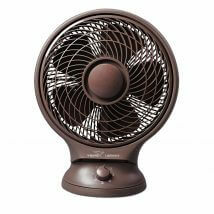 This is the fan you need if you want something that is almost noiseless, even when it’s running at higher speeds. It’s particularly recommended for those who cannot or do not want to use air conditioners, and need something to keep them cool at night, without disturbing their sleep. Although, it is one of the most expensive table fans on the market, so if you’re not keen on spending a bit, then this isn’t for you. You do end up saving money eventually though, as it comes with a warranty of 2 years, so even if you face any troubles after the first 12 months, you won’t need to worry. One of the most powerful table fans on the market, this is the one you need if you tend to sweat a lot while cooking in the kitchen. It is so strong that even if you’re standing 4 feet away from it, you will still be able to feel its effects, so strong that you would need to be careful while using powdered spices to keep them from getting blown away. It’s also one of the lightest products, weighing just 2.75 kg, so you can easily move it around as you please. In addition, it comes with a warranty of two years, so you needn’t worry about repairs, and it’s also priced economically, so you won’t need to burn a hole in your pocket to keep yourself cool while you cook. If you’ve got a smaller office cubicle or study table, and need a table fan that doesn’t occupy too much space, then this is the one for you. Aside from being compact, it’s also noiseless, so it won’t bother you while you work, and it comes with a 1-year warranty, so you won’t need to worry about repairs either. It comes with a speed regulator, so you won’t need to worry about important documents being blown away, and it does not heat up even if it’s left switched on for several hours. In addition to all of that, it is the only fan that is already assembled, so you’ll save time as well. The best table fan on the market, this is the one you need if you’re looking for a powerful yet noiseless fan to work for all sorts of settings. Although it looks small, it works well in larger rooms too, and as it has three different speed settings, whether you want to use it in the kitchen, or at work, this will not fail you. Regardless of what speed you’re using it on, it remains almost completely noiseless, so you will barely even notice it, and it’s easy to dismantle and assemble, making it really easy to clean as well. Considering all of its features, plus the fact that you get a 1-year warranty, the affordable price tag is just the cherry on top. 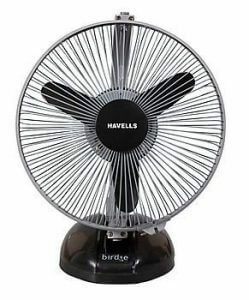 There are many who assume that the only differences between table fans lie in their size and colour, however, as you would’ve seen by now, there are several other factors you need to keep in mind if you want to buy the best table fan for yourself. We hope our article has helped you understand all the minute details you need to keep an eye out for, and how your choice must be based on your specific needs. We also hope our list of recommended products made it easier for you to choose one, and more convenient to buy it as well.